The Chargers left San Diego because of stadium issues and were one of the few teams that used to have trouble with television blackouts. For the next few years, they will be calling a soccer stadium, the StubHub Center, home. Surely, they will not have any trouble selling out a 27,000 seat-stadium—right? If how they’ve been playing during the preseason is any indication, they might. 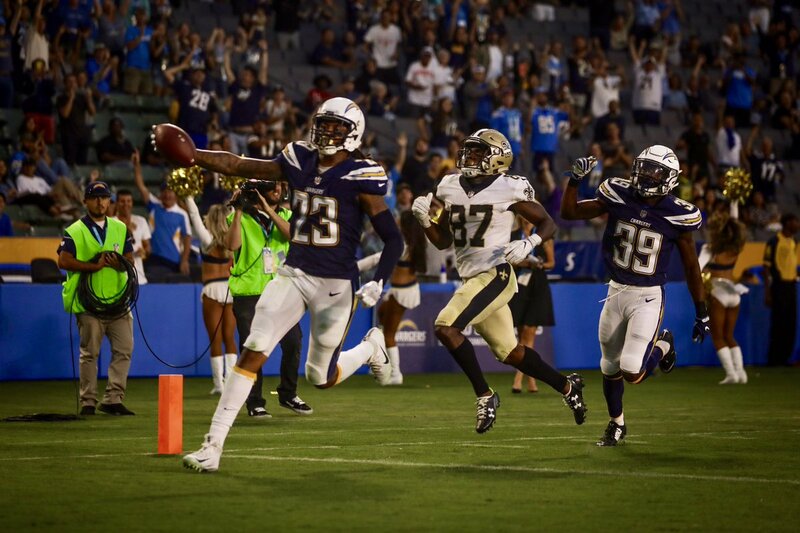 Like every other team in the NFL, the Chargers have not been trying to put their best foot forward during either of the preseason games they have played. Phillip Rivers played a little bit in the first one (and looked fantastic). But he did not play at all Sunday night against the New Orleans Saints. The Chargers better pray that nothing happens to Phillip Rivers. If something does, they are screwed. Kellen Clemens is incapable of getting the job done, and Cardale Jones is an offseason or two away from being NFL-ready. The Chargers have now gone seven quarters without putting the ball in the end zone on offense. They may be decent when the starters play, but if too many guys get injured they will be in trouble. Nice job, Dexter McCoil! Thanks to him, the final score doesn’t look as bad as the game did. Snagging an interception in the red zone and running it all the way back for a touchdown is a great way to insure you get a roster spot. The New Orleans Saints might have a defense this season! Getting eight sacks in a preseason game means nothing in the long run, but it gives fans a reason to be hopeful in the short-term. The offense has never been a problem for the Saints. It’s always been the defense holding them back. 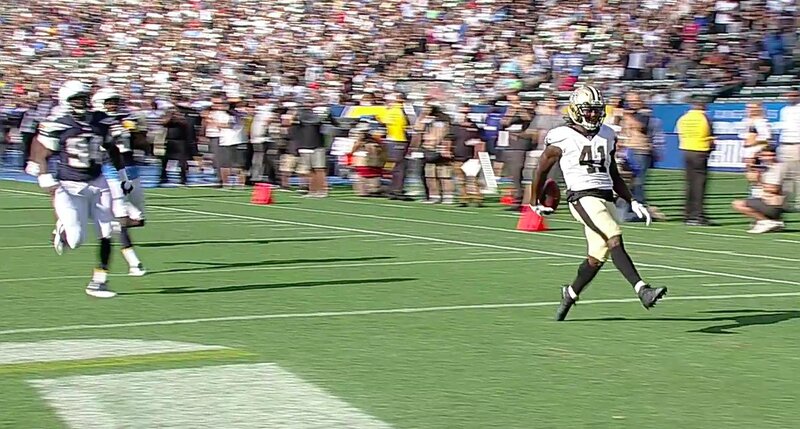 Alvin Kamara may not get as much attention as the Saints other running backs, but he has big play potential. He showed that when he opened the game with a 50-yard touchdown run. He later added a nice 22-yard reception. He’s had a good preseason, so keep an eye on him fantasy football players. “He’s really fast. I saw him and all of a sudden he was like in the open field, so it’s pretty cool,” Saints quarterback Chase Daniel said after the game. The Chargers may be wishing they had held onto Manti Te’o. He had a sack and eight tackles (three for a loss) in the first half alone. The 13-7 win was the first preseason win for the Saints in a long time (had been on a 10-game losing streak). Yeah, it doesn’t matter. But it is always better to come out on top regardless of the perceived importance of a game. Darius Victor could be worth keeping an eye on in the future. The Saints are obviously going with Adrian Peterson and Mark Ingram. Rookie Alvin Kamara will have a role, but Victor showed some real potential (14 carries for 58 yards). There is a very good reason why the New York Giants let Ryan Nassib go. After Sunday’s performance, it should be clear to the New Orleans Saints as well (6-15 for 55 yards and one interception). The Saints will have an interesting challenge on their hands in the all-important third preseason game when the Houston Texans come to town on Saturday (8 PM ET kickoff). The Chargers will try to look better when they face the Rams, also on Saturday (8 PM ET kickoff).